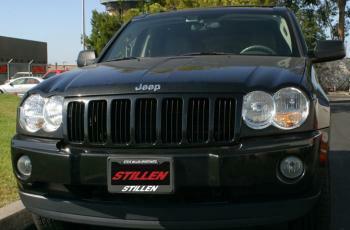 STILLEN Headlight Accents JEEP - Dezod Motorsports Inc - Home of the automotive performance enthusiast since 2002. These paintable urethane headlight accents complete the styling to the front of your Jeep Grand Cherokee (including SRT-8). The accents design follow the OEM headlight curves, and install extremely quickly. Fitment is very snug and precise, but 3M tape is also included and pre-installed on the accents. The headlight accents are crafted from urethane, offering a durable and OEM quality fit and finish. Painting and installation instructions are included, please note with any urethane body component, automotive primer (not adhesion promoter) should be used in prepping for paint, including a flex agent to ensure an OEM finish.